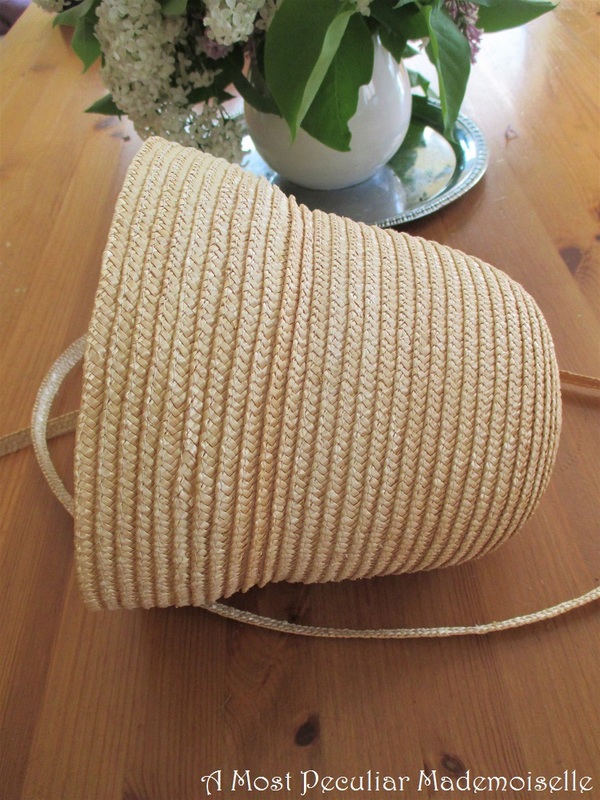 About eleven years ago, when I lived in my first flat, I picked up a straw hat in a charity shop, stitched with cotton thread. I’m afraid I don’t have a picture of how it looked, but imagine something closely akin to a “dixie cup” sailors cap. 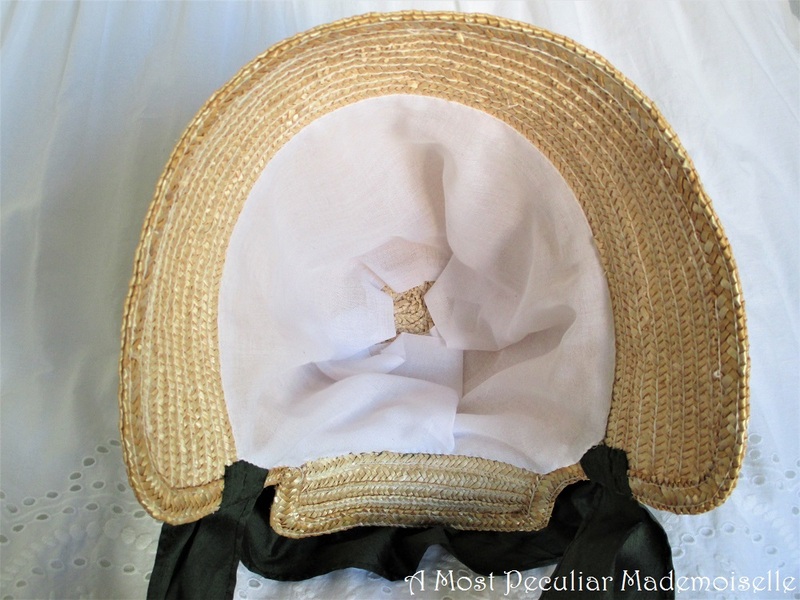 I realised that when unfolded it would form a good base for a 19th century bonnet, but I didn’t yet know if I wanted an Empire/Regency one or an 1840’s one. So, like many other “someday I’m going to make something really nice from this” items, it ended up in my stash. I took it out from time to time, but never felt brave enough to get started. And then I had an event coming up, the opening of an exhibition of women’s fashion from the 18th century to today. I was, with some others, invited to the opening and asked to come in clothing from any of the periods represented in the exhibition. 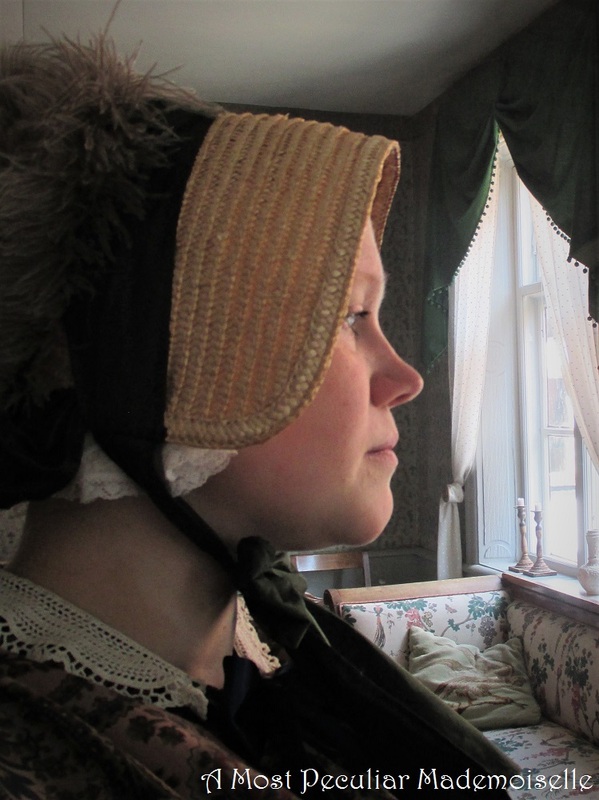 I decided on the 1840’s maternity dress I made three years ago. 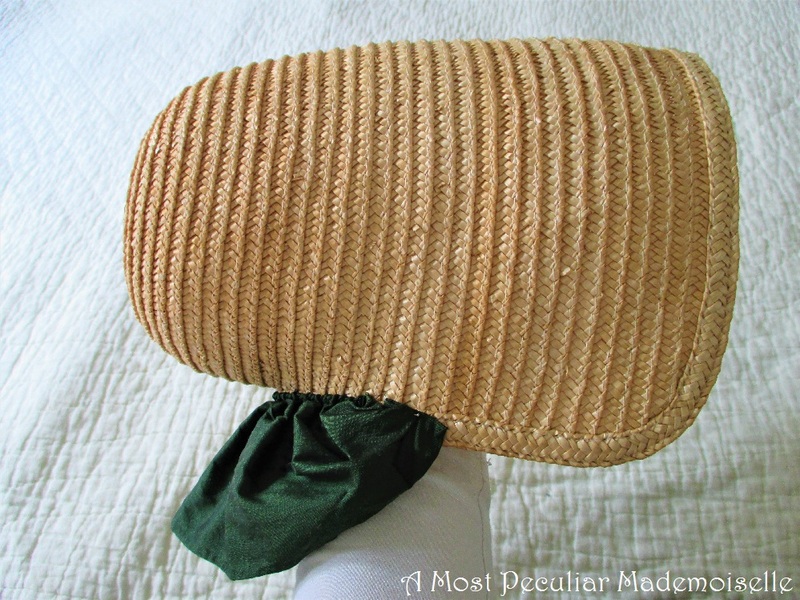 The dress is nice, but I felt I needed a bonnet to look properly attired, so I finally got to work on transforming the straw hat into a bonnet. 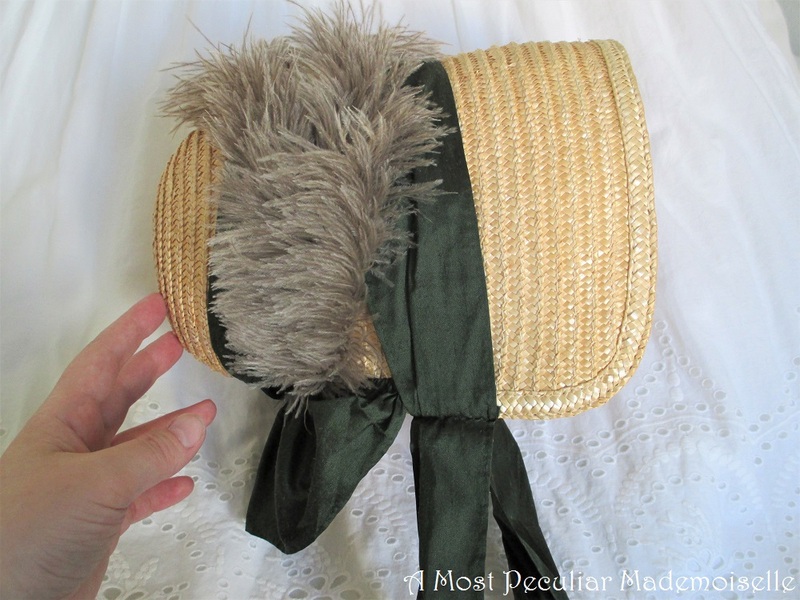 First I unpicked the stitches holding the straw braid for a few feet, so I could use that to edge the finished bonnet with. You can see the crease where the brim was originally folded upwards. Then I dunked the bonnet in water to make it less brittle and cut out a piece for the neck. 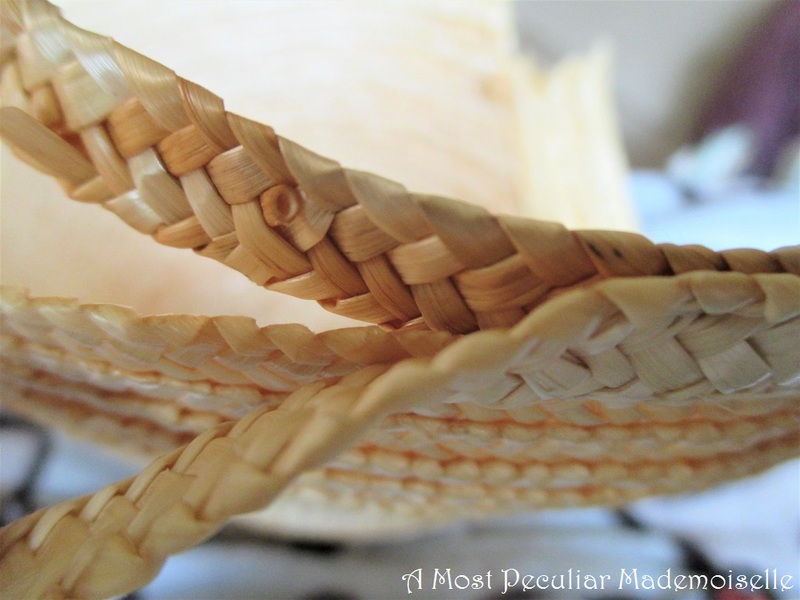 I had a plan for the cut-off pieces of braid, but later I thought I should have curved the brim down towards the chin instead of cutting it straight. You live and learn. The pieces of braid just mentioned I used to make a sort of bavolet at the neck. 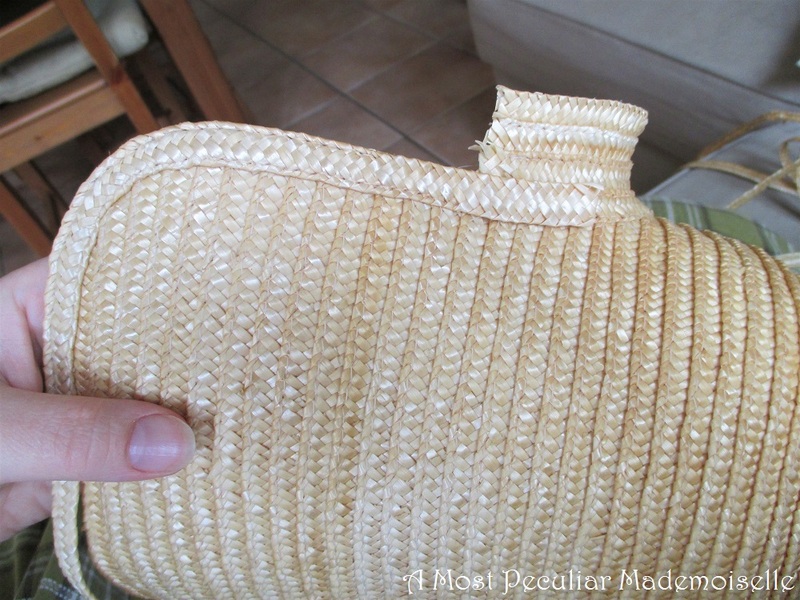 When the shape of the bonnet was what I wanted it to I started stitching the braid I removed previously to the edge. It turned out I didn’t have quite enough, so I took another braid I had in my stash for the inside. I stitched them both on simultaneously, making sure the straw was wet the whole time. This is how the bonnet looked when I’d finished the sewing, but before blocking. I shaped it while wet and set it to dry, with a pot of honey at the bottom of the crown to make it flatter. Then it was time for trimming. This was an all-stash project, so I picked out a scrap of green silk dupioni. Taffeta would have been better, and taffeta ribbons best of all, but I didn’t have any. I hemmed strips of the silk for ties and trim. 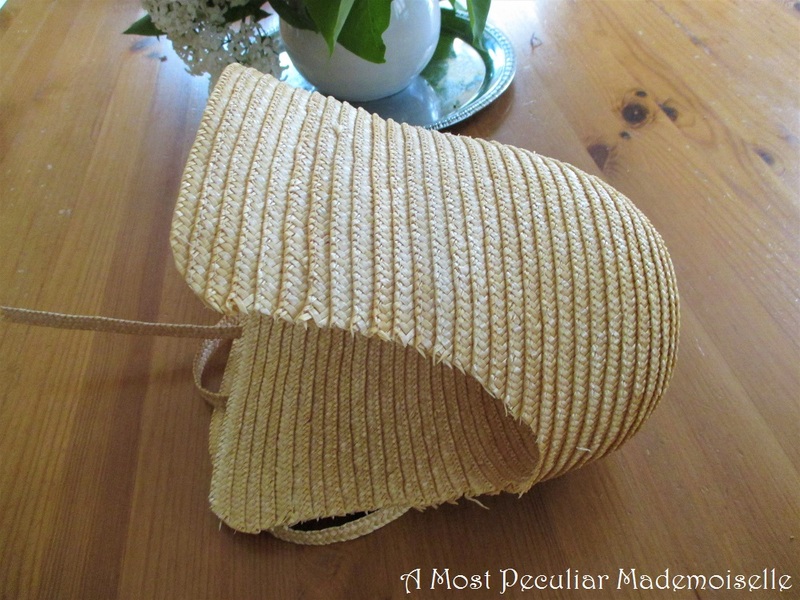 I wasn’t quite happy with the straw bavolet, so decided to cover it with a silk one that I gathered to the proper length using whipped gathers. I wrapped a long strip of silk round the bonnet, arranging artful creases here and there. Silk ties were also attached. 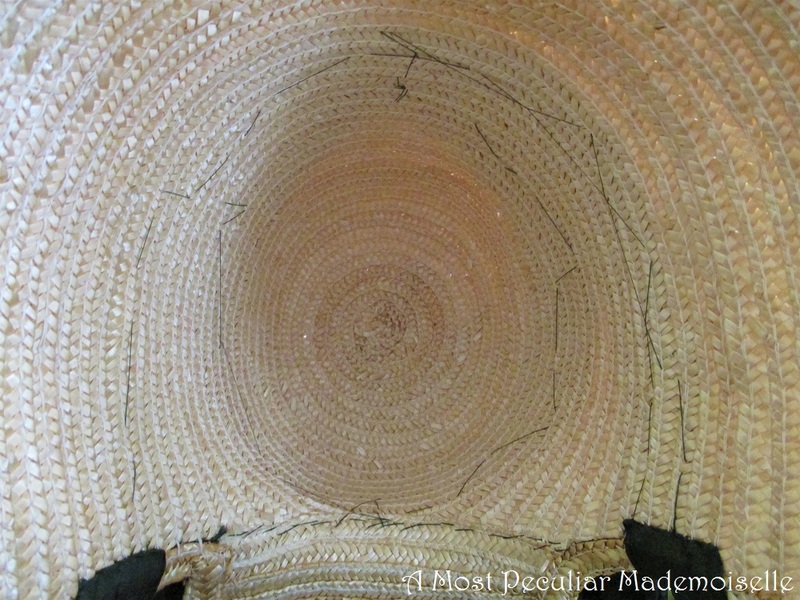 The silk was attached with very untidy stitches on the inside, as seen in period bonnets. Makes it easy to change the trim if wanted. Then I was a bit unsure if I should leave it as was – after all, it looked very pretty that way – or add ostrich plumes. As I was dressing as a close to middle aged, married bourgeoise woman, I decided more was more in this case. 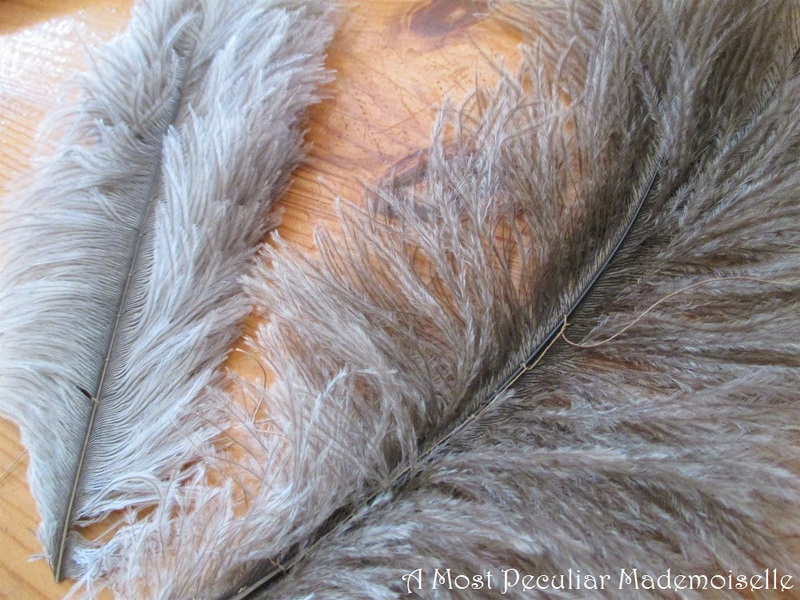 I had some ostrich feathers that had fallen out of my feather duster and been saved for a moment like this. I picked out four, and stitched them together two-and-two with silk thread to make them fuller. Then I attached them to the bonnet, again using long stitches on the inside. They turned out looking pleasantly fluffy, adding just the right oomph to the bonnet. But the bonnet snagged my hair, so after consulting knowledgeable people I made a half lining using a thin cotton fabric. 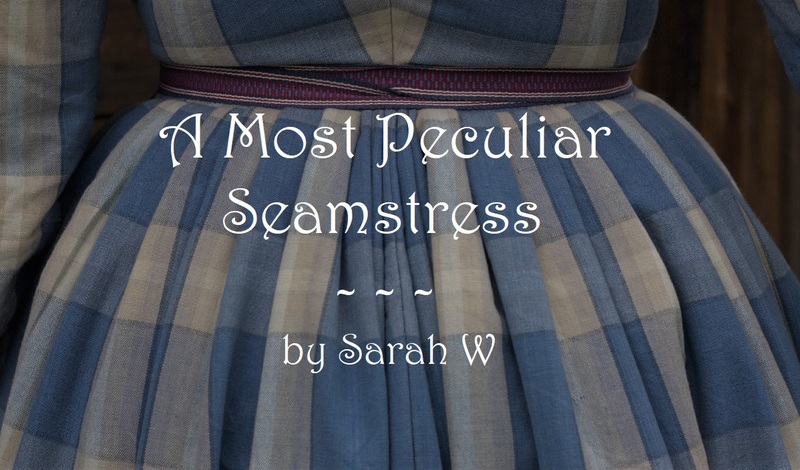 Not the most historically accurate fabric for this, but it had to do. And that was that, all finished. I hadn’t added cheek ruffles to the inside, so I wore a cap under the bonnet instead to give a similar effect. It might be an old-fashioned thing to do for the 1840’s, but it looked nice enough. 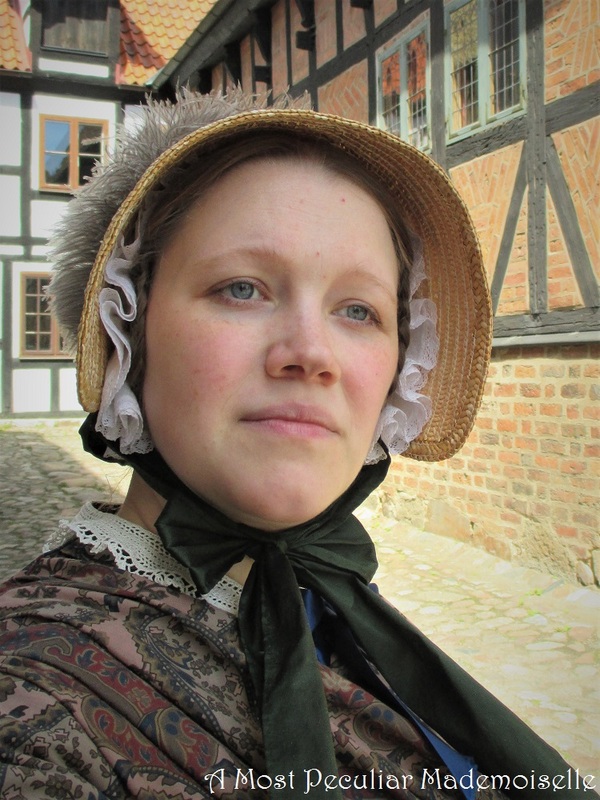 I felt very Cranford. Maybe I’ll just sell it – without the plumes it would look lovely on a girl – and try again. 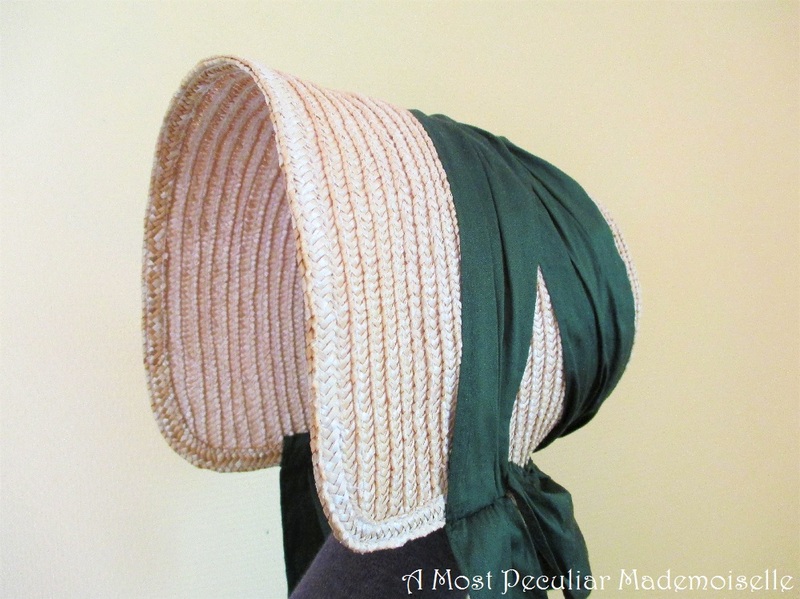 My Pinterest board of extant 1840’s bonnets. 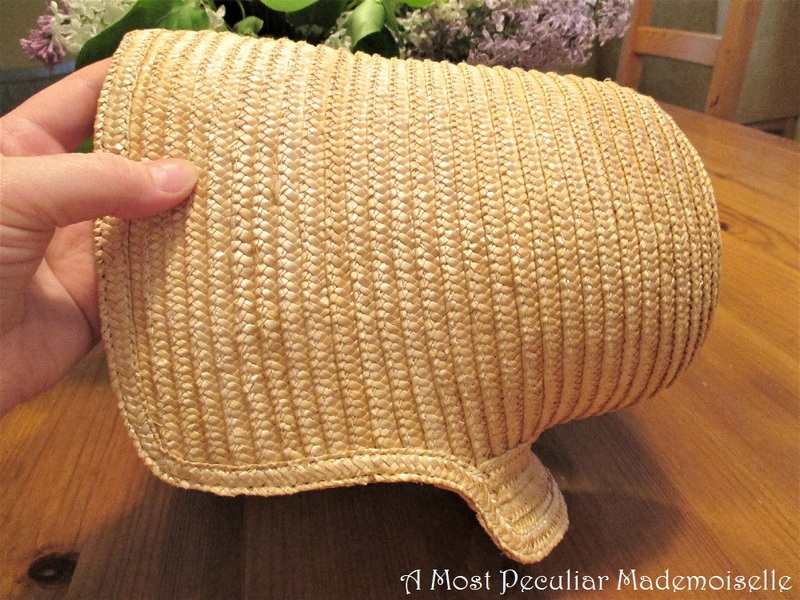 Your straw bonnet turned out beautifully! Job very well done! On the other hand, you have a charming profile, and that is not to be discounted! Well done on the bonnet!